Main Page - Lakeshore Resort - Lakeshore Resort on Lake Osakis is peacefully located at the end of a 1/4 mile long private drive on a peninsula with lake on 3 sides. All cabins are close to the water and on level grounds. Lake or Pier Fishing on Lake Osakis. We are well known for our dock fishing. 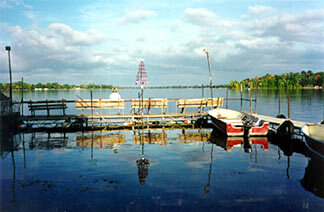 We are located in a sheltered bay on the northwest shore of one of Minnesota's best fishing lakes, Lake Osakis. Since we are on the North end of the wide lake section and on the West end of the narrows, you have a choice of nearby areas in which to fish. Our location affords you the opportunity to fish in protected areas on extremely windy days. Peaceful - Relaxing - Lakeshore Resort is peacefully situated at the end of a 1/4 mile long private drive on a peninsula surrounded by lake on 3 sides. All cabins are close to the water and on level grounds. Pier Fishing - Catch walleye, northern, sunfish and crappie from 5 lighted fishing piers located on the best fishing hot-spot of Lake Osakis. The lake has 6389 acres of water with unexcelled quantity and quality multi-species fishing. Family Resort - In addition to fishing, we provide everything for the traditional family vacation at the lake. Every photo on our site is clickable for a larger view. Try it! Please browse our site and we hope to see you soon!